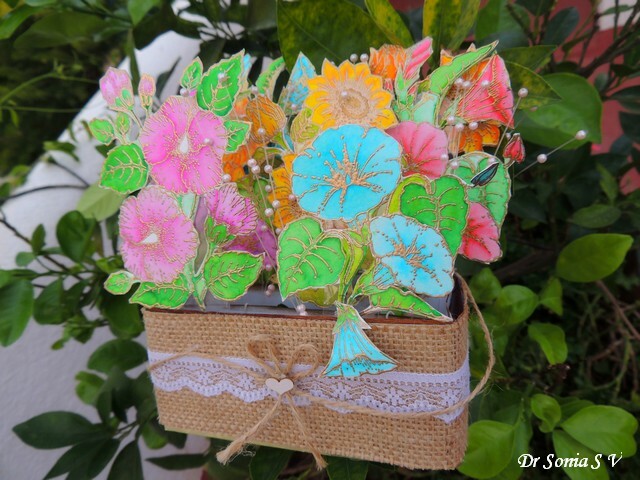 Hi friends, Sharing my DT project for Crealies showcasing their gorgeous rubber stamps.I made a Pop Up Box card with more than a dozen stamped flowers swaying beautifully in a burlap covered Pop Up Basket ! When you want to quickly color a bunch of images without spending hours together watercoloring is a fabulous option! 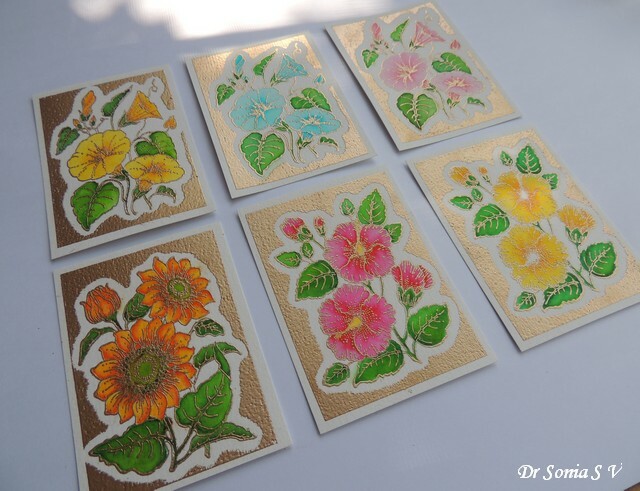 And heat embossing the images before watercoloring makes it even easier to keep the colors within the lines. 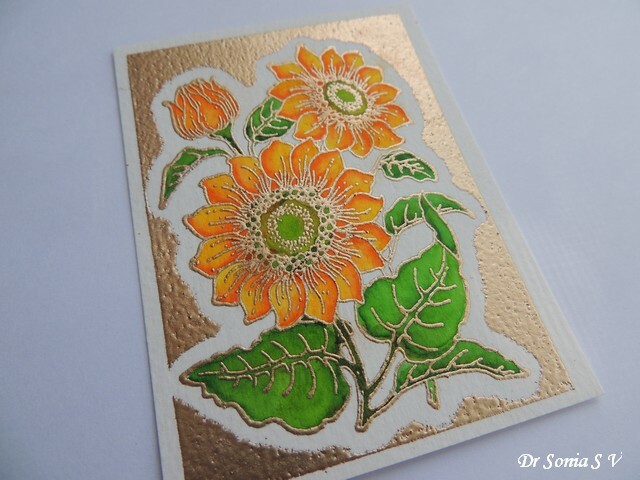 I stamped and heat embossed the images in gold and watercolored them using Zig Watercolor Brush Pens . These are the Crealies stamps I used. 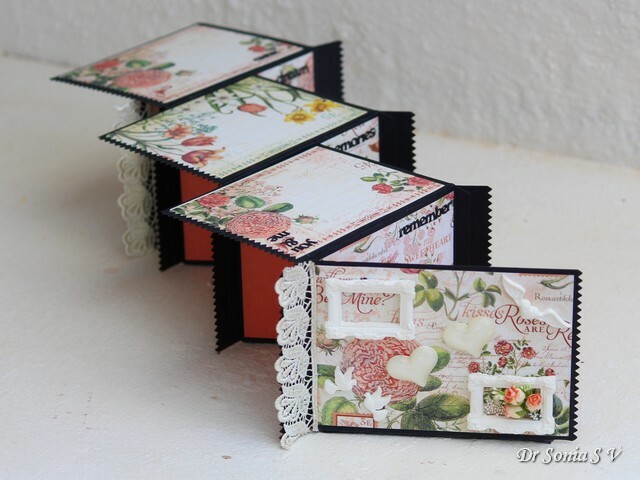 I love the delicate designs and quality of the Crealies stamps! 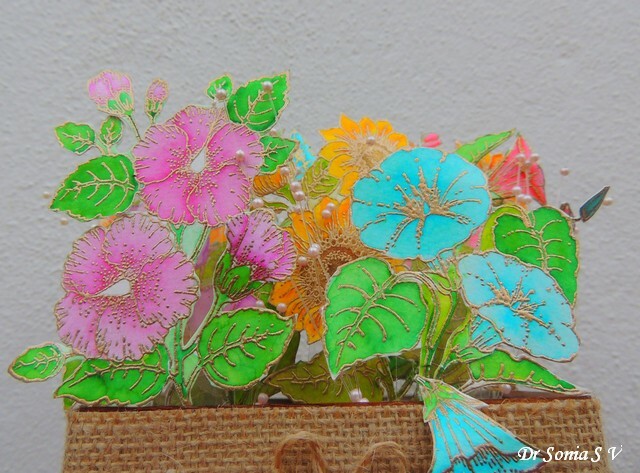 Later fussy cut out the flowers ...you dont have to be super accurate when making such a card as you can use a bit of green between the leaves and flowers to mimic foliage. 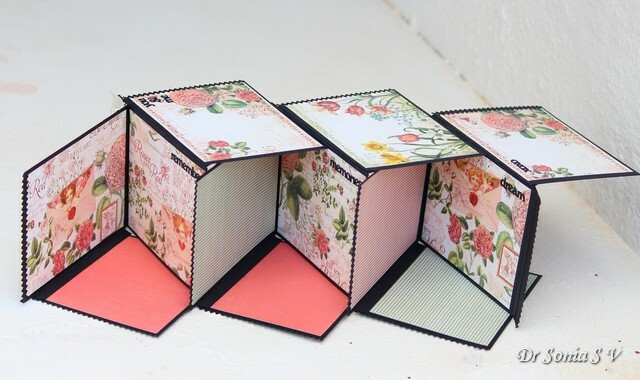 Pop Up Box Cards are fun designs you can adapt to suit your theme. 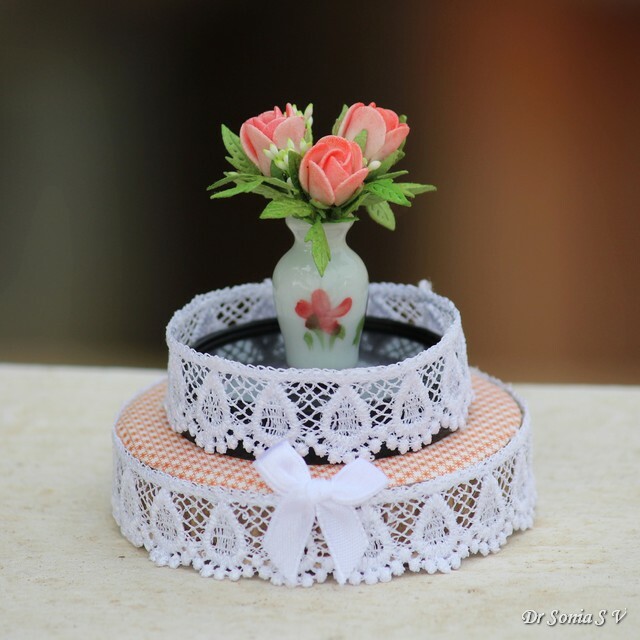 I conceptualized a basket of flowers with a rustic look and so made a horizontal boxthe Here are the dimensions on instructions to make this one. 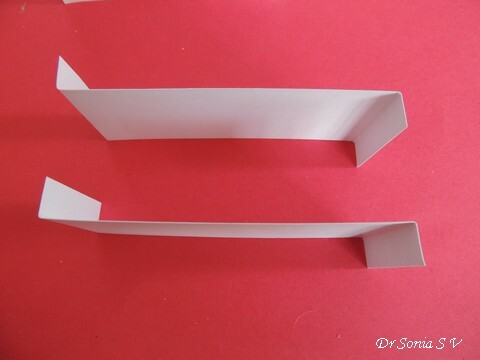 Fold the long pieces as shown below. 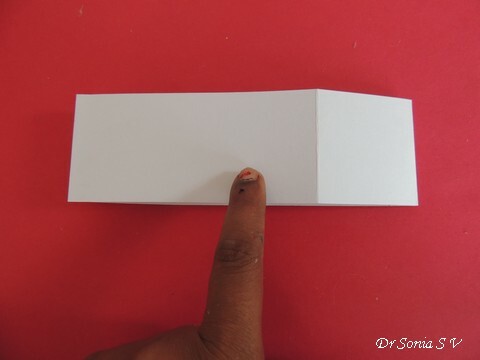 Stick the short tab as shown- use good strong adhesive. 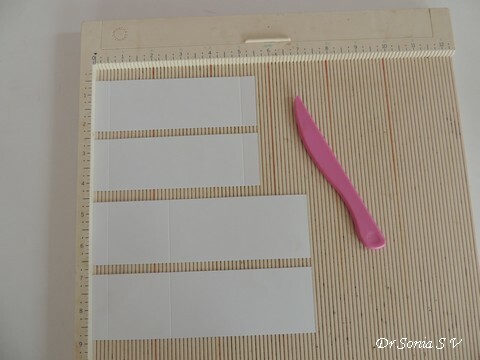 Stick the short tab of the other strip to complete a box. 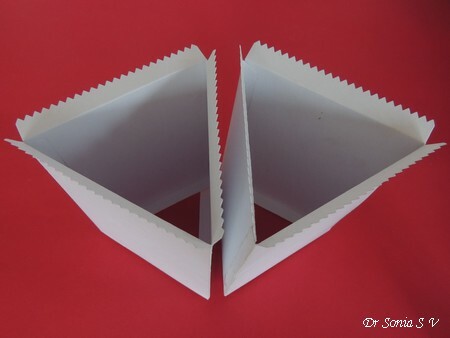 Take the scored short strips and fold the side tabs in opposite directions- this tiny step will make your Pop Up Card more sturdy. 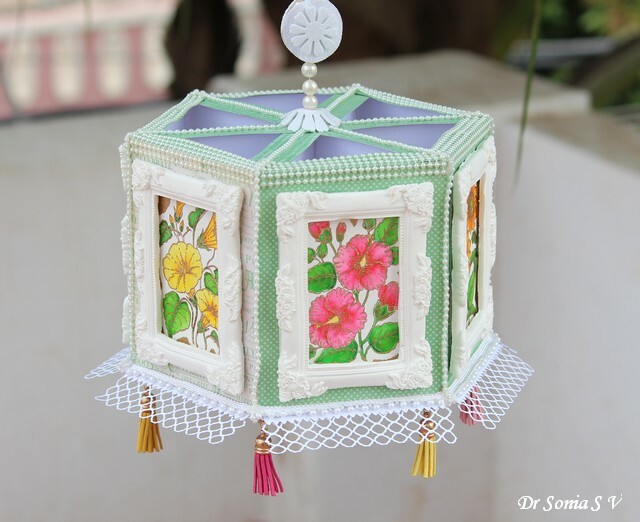 Your Pop Up Card is ready to embellish! 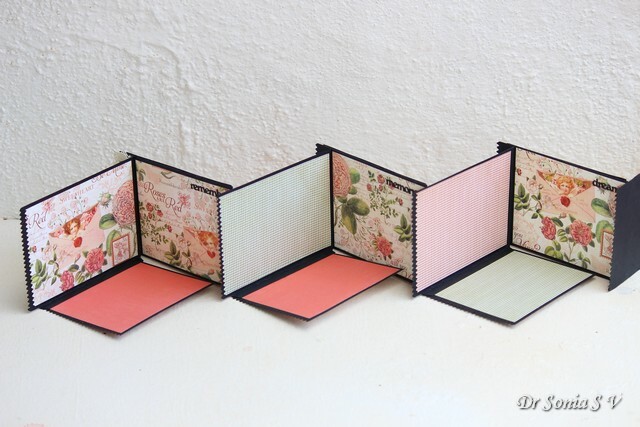 You can use strips of acetate to stick the flowers and add them to your Pop Up Card dividers. 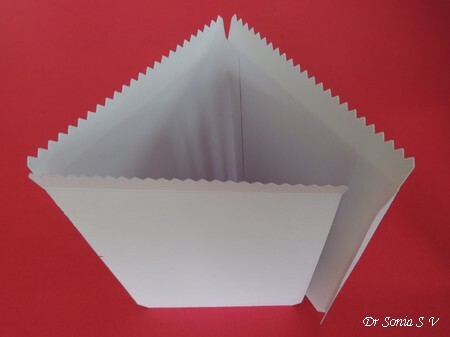 The pearl sprigs were simply wound around the dividers and sway beautifully as the card folds and unfolds! 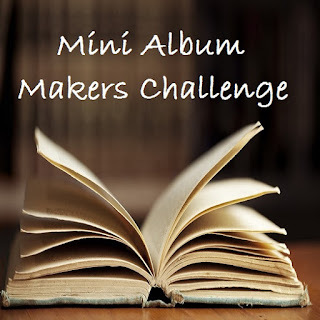 Hello friends, Thank you so much for all the Anniversary wishes you showered upon me in my last blogpost " Mini Album Tutorial " . 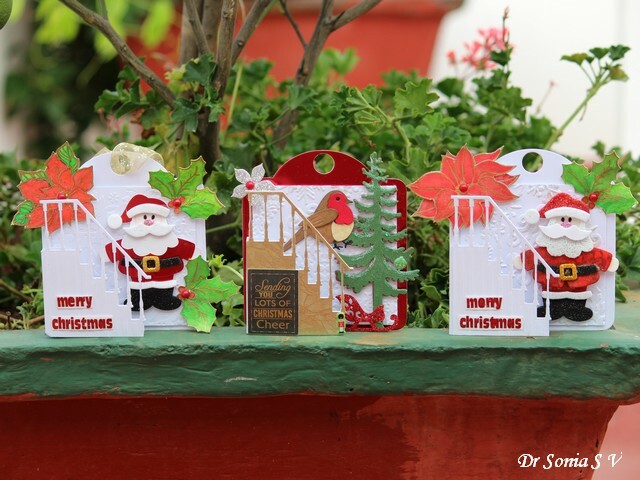 Sharing a trio of 3 D Christmas tags made as my DT project for Maureen's Rudolph Days Challenge! 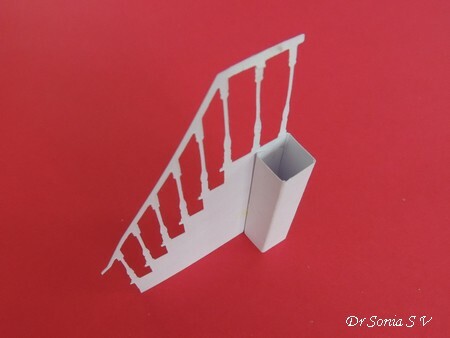 The 3 D tags/mini cards feature a pop up staircase which can fold flat. 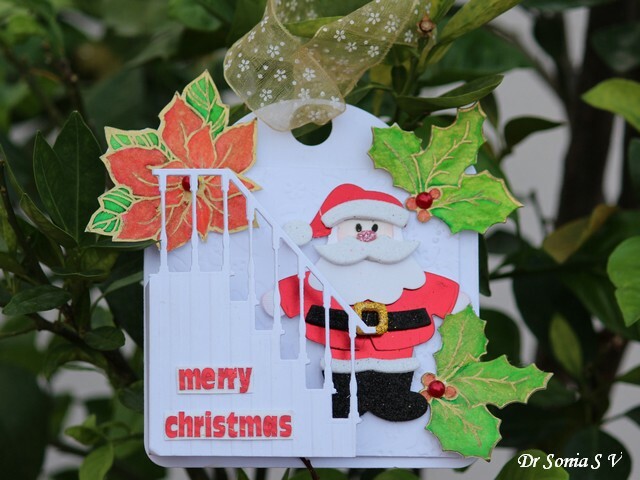 2 of the tags feature an adorable Santa standing on the steps of a staircase . The holly leaves and poinsettias are from a stamp set gifted to me by Maureen. 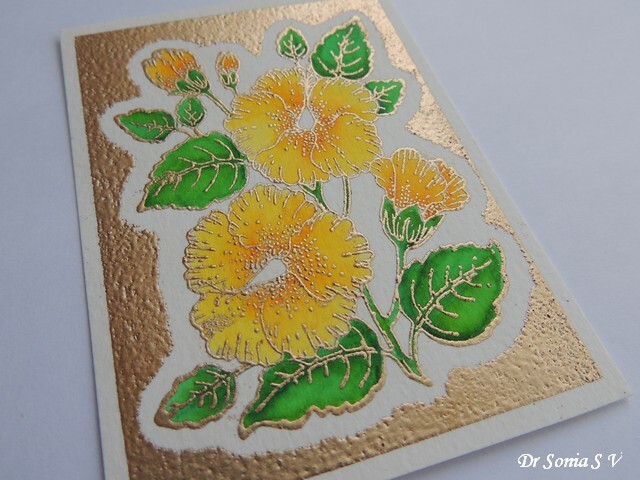 I stamped and gold embossed the images and after water-coloring with Zig Watercolor Brush Pens gave a wash of gold using Gansai Tambi watercolors! Love the look! 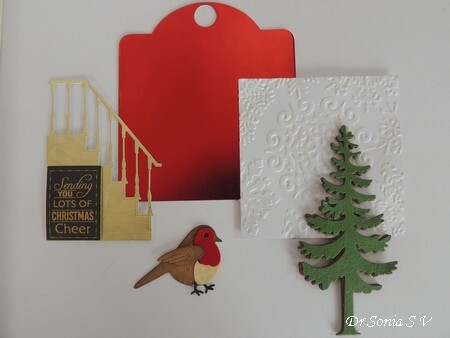 The 2nd tag has a golden staircase with a cute Christmas robin made with Dee's Distinctively Winter Robin die again a gift from Maureen. Made the tree using handmade paper and foam as a backing. 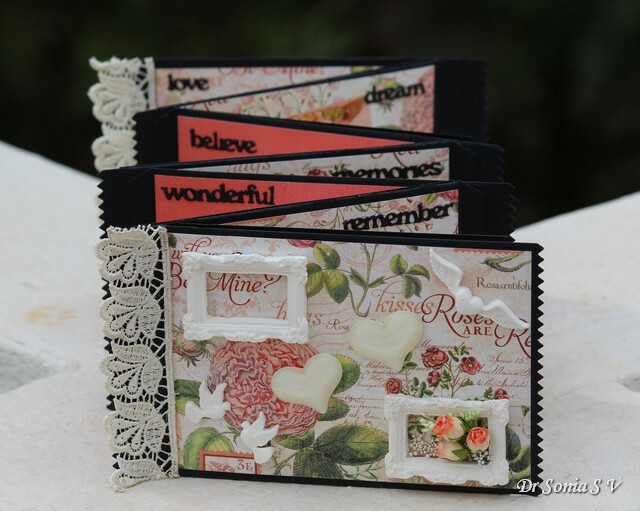 I bought the newly launched Graphic 45 square tag die and used it to make the frame for all the tags. Embossed a square of white card stock to layer over it. 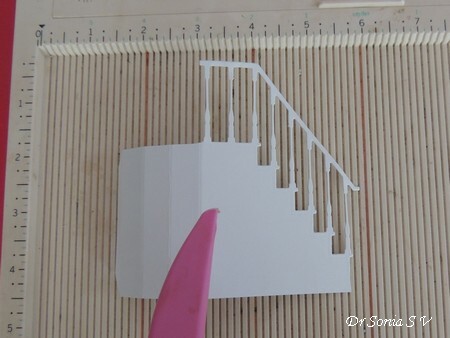 The staircase I used was diecut using a Memory Box die but I think there are quite a few companies who manufacture staircase dies. I made it upside down for the next step which is scoring. 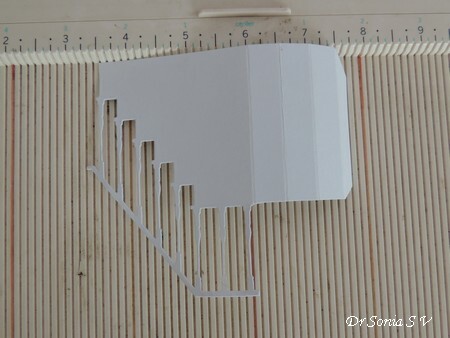 Score at 1/2 inch intervals to get four 1/2 inch segments and cut off the extra card-stock. 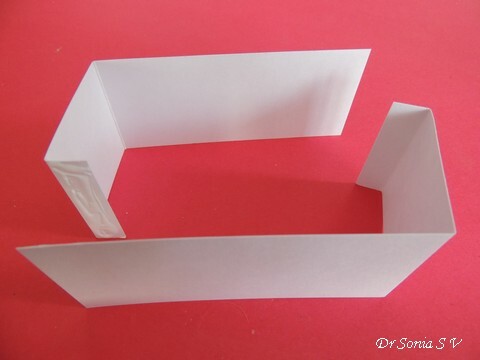 Fold at the score lines and glue the last segment behind your staircase...you get a nice pop up 3 D structure which you can glue to your cards/ tags! 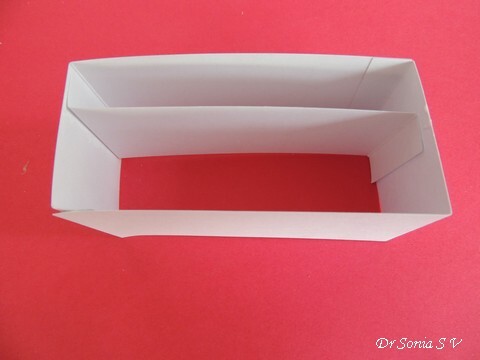 I hope you liked this easy idea to make a pop up element...it can be adapted to any theme! 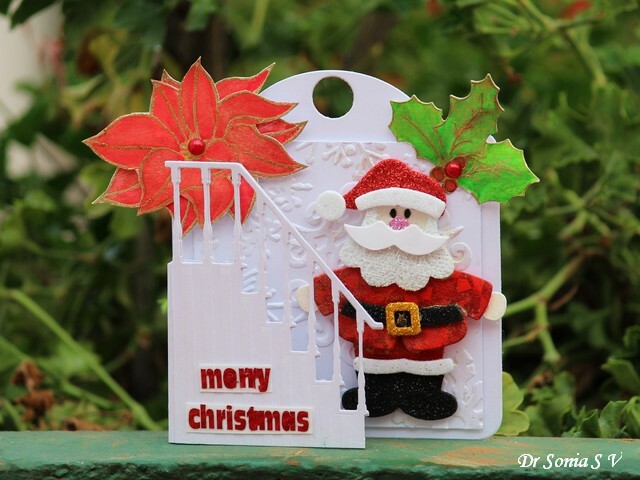 Wishing you a good day with this cute Santa made using various types of foam! Don't forget to link in a Christmas Project at the Rudolph Days Challenge! Linking to Simon Says Stamp Monday Challenge - Inspired by a Song- Mine is "We wish you a Merry Christmas"
Hi friends, this week my husband and I celebrated our 13th wedding anniversary. 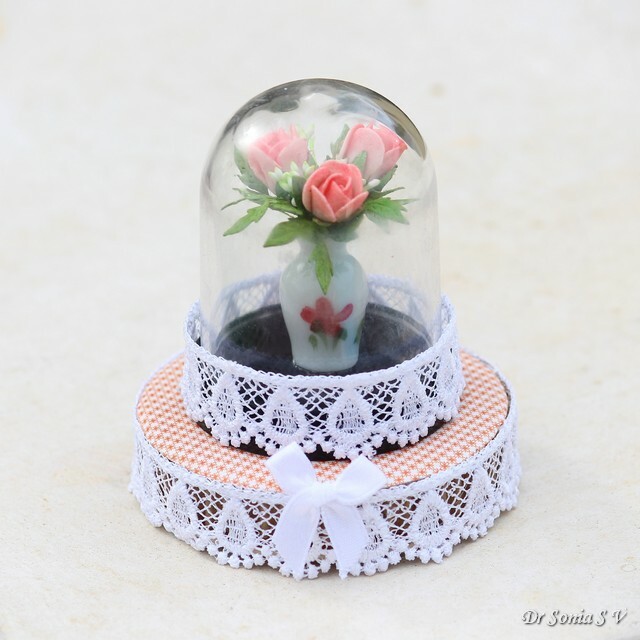 I was at a loss on what to buy him but since he loves handmade gifts I made a special Multi-fold Mini Album and a bouquet of tiny handmade foamiran roses in a dome as an anniversary gift. 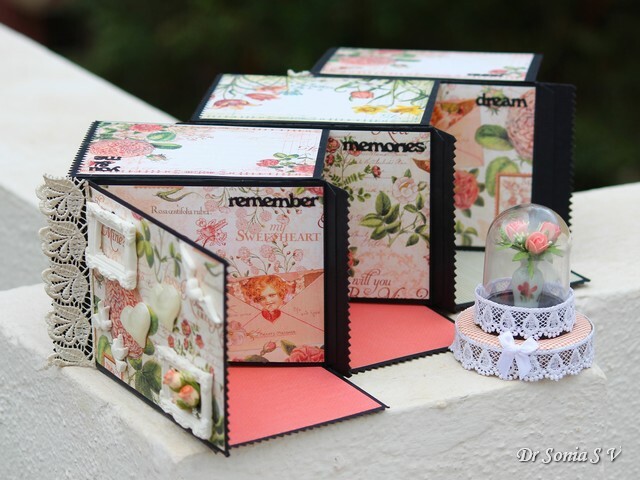 I made this mini album using sturdy black card stock from Crafters Corner, gorgeous Graphic 45 papers, Crealies Cardzz No 06 die [also featured in this Home Decor project Tutorial ] and Crealies Text Dies. 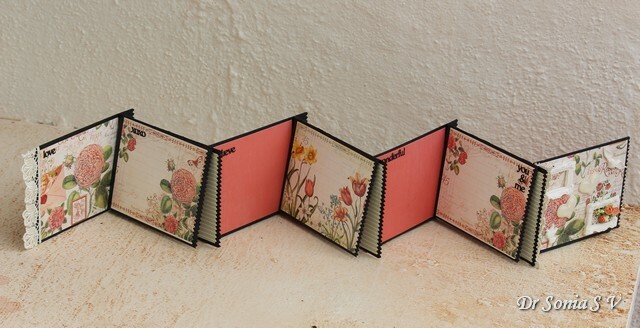 The photos above and below who how the accordion album looks on one side and how the flaps fold down! 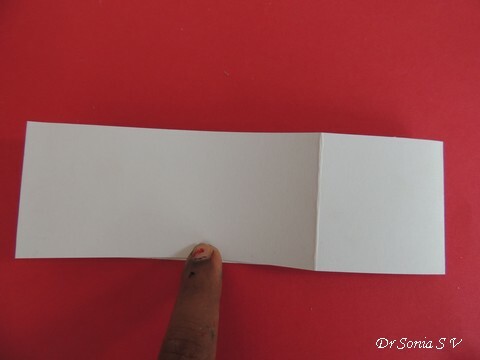 And there are flaps which fold up on the other side and the whole album can be displayed in a zig zag fashion as shown below. 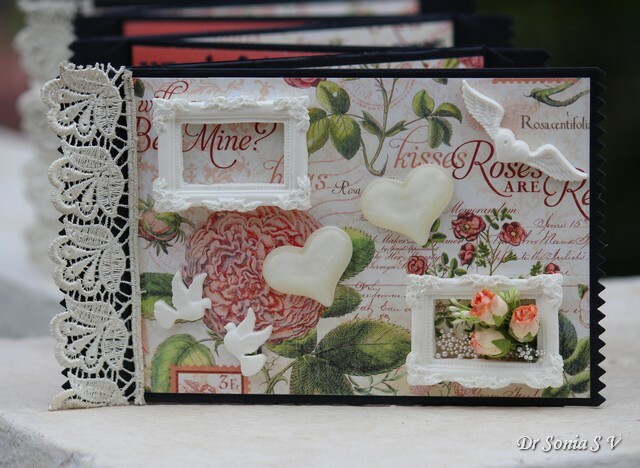 The frames, doves and winged hearts on the cover page were handmade using air drying clay[ Japanese Sakura caly] and the gorgeous hearts are from Crafters Corner. Here is how the other side of the mini album looks. 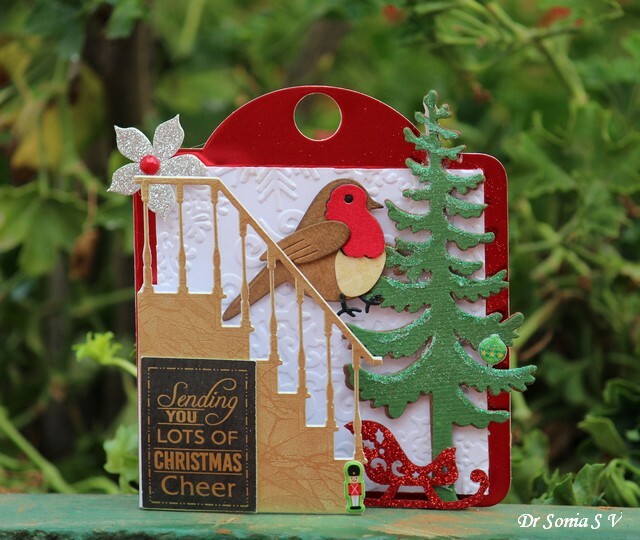 I love how the serrated edge created using the Crealies Cardzz No 06 dies looks! 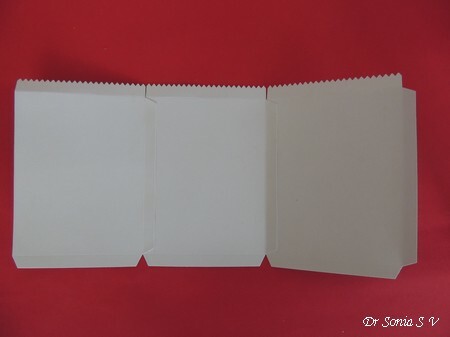 The flaps on this side fold up and this is how the mini album can be displayed! 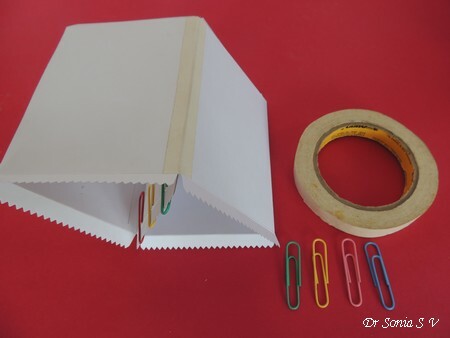 In the album shown here I have used 7 bases and 6 flaps and it can hold 25 photos excluding the cover. You can easily add more pages and flaps if you wish and even tweak the dimensions! 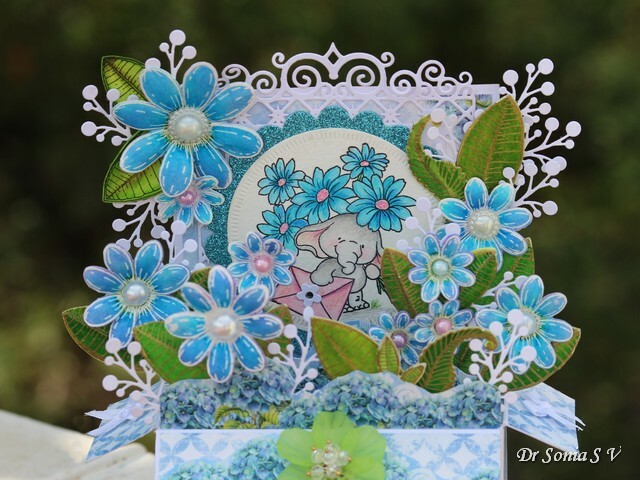 Creating this mini using the Crealies Cardzz No 6 die was a breeze as using this die you get die cuts with in-built tabs which you can use to create the folds easily . 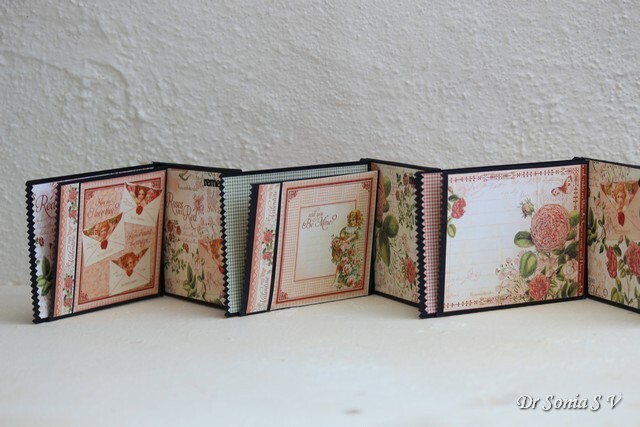 I have a detailed Tutorial on the Crealies blog on how you can make this Mini Album easily using Crealies dies. 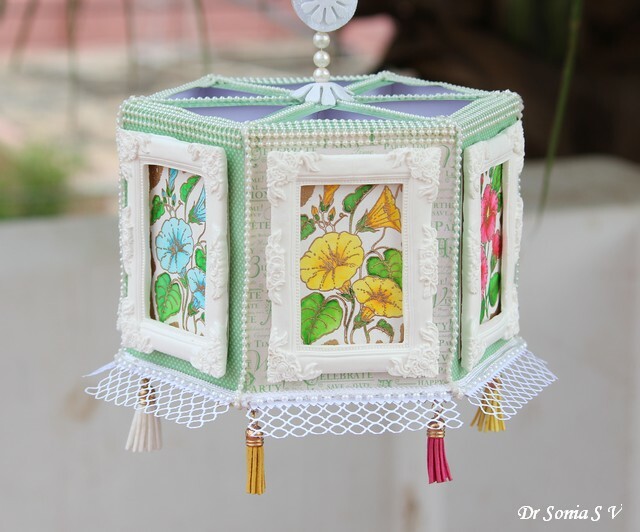 But in case you don't own a die cutting machine don't despair...I am also sharing a video Tutorial on how you can make a similar mini using just scissors and glue! 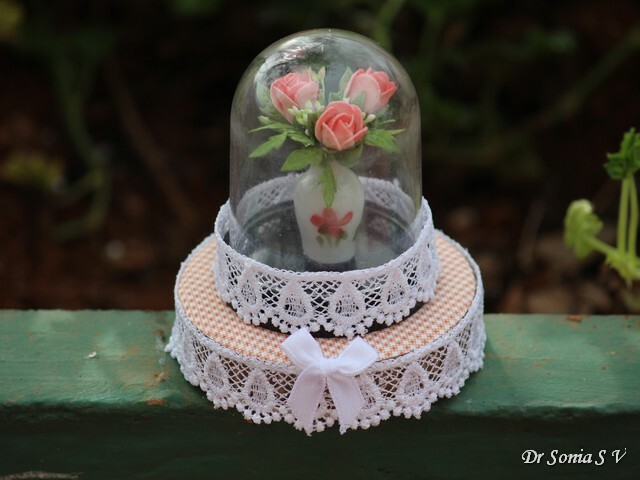 My husband loves flowers and I made a bouquet of 3 tiny roses using foamiran and added them to a tiny ceramic vase to fit inside a cute dome from Crafters Corner. 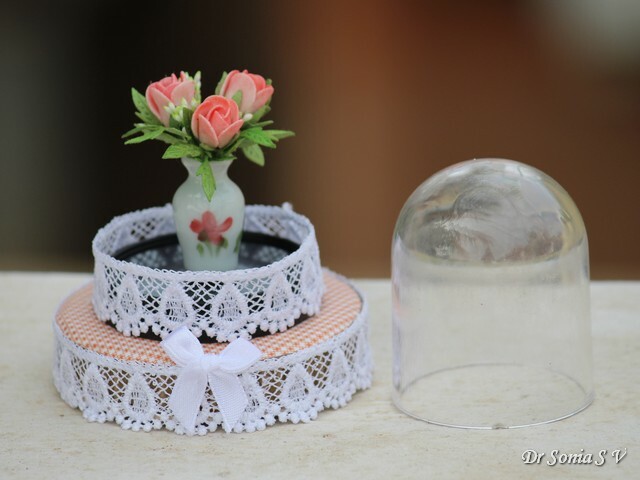 The domes are a new addition to Crafters Corner and I love how gorgeous they look! 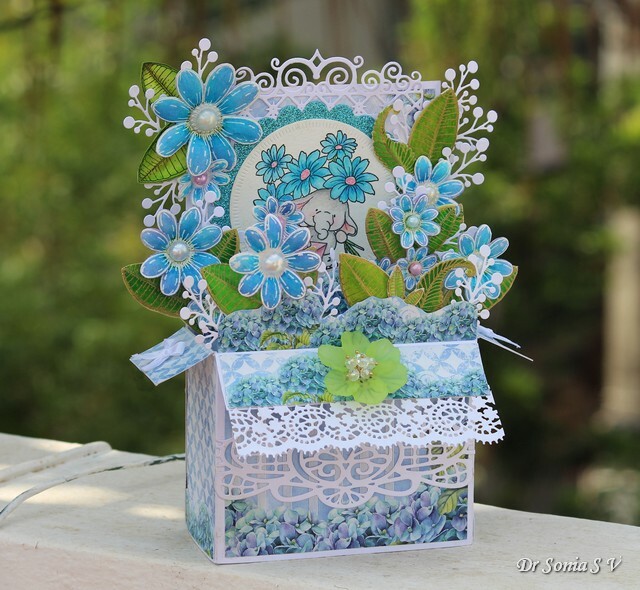 Hi friends sharing a Pop Up Box Card made as my DT inspiration for the Cuttlebugmania Challenge where it was my turn to chose the theme and it is Interactive cards...you can make shakers, sliders , Pop Up Cards etc. 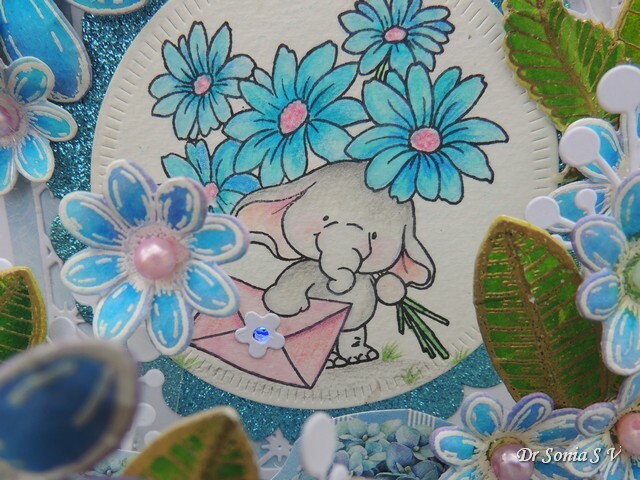 My Pop Up Box card is a very special birthday card made for my daughter!It has so many layers and lovely cheerful daisies and wild tropical leaves swaying on strips of acetate !Hiding all the way at the back but still occupying centre stage is an adorable baby elephant clutching a bunch of daisies and an envelope . There is a huge amount of stamping and die cutting in this card and I really went to town with the water coloring too! 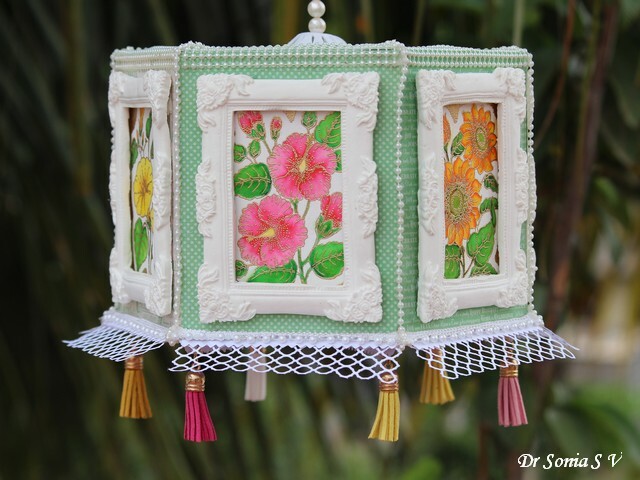 Hi friends hope you are all doing well....I am so happy to be back in the crafting world and am so thrilled to share that I have joined Crealies as part of their International Design Team. I very very rarely even think of applying to a design team as my schedule is pretty busy but I have been in love with the unique style of Crealies products for quite some time and so when Annelies , the owner of Crealies let me know that they were having a DT call...I applied following my heart!For once I didnt listen to the negative voices in my head telling me I wouldnt be able to handle it and a trillion other excuses our brains do tell us! 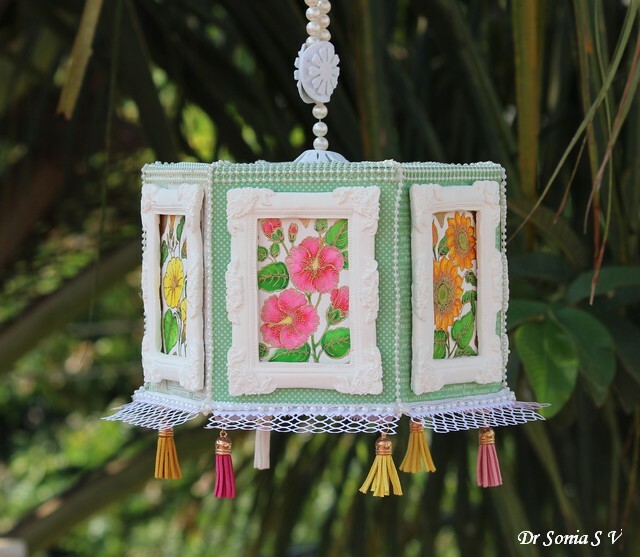 Now I am part of the Crealies team and so happy to share my first DT post... a Spring themed Home Decor project featuring the new Crealies Cardzz no. 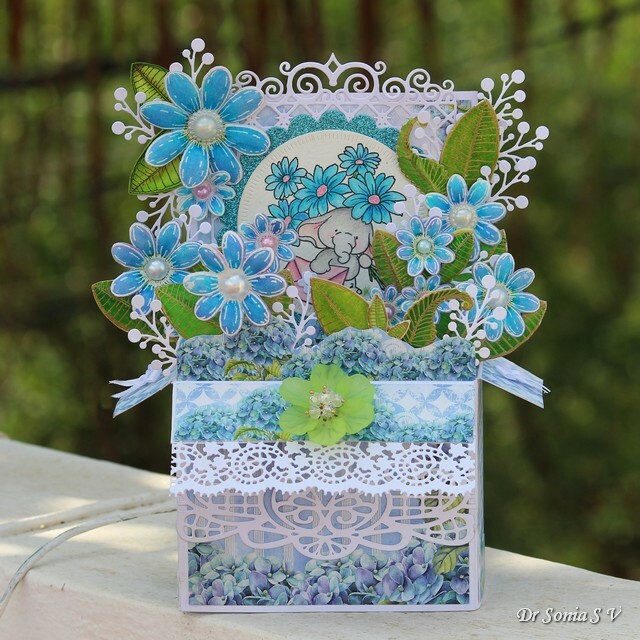 06 Bag Card Dies and showcasing the newly launched beautiful Crealies Mounted Rubber Flower Stampzz. 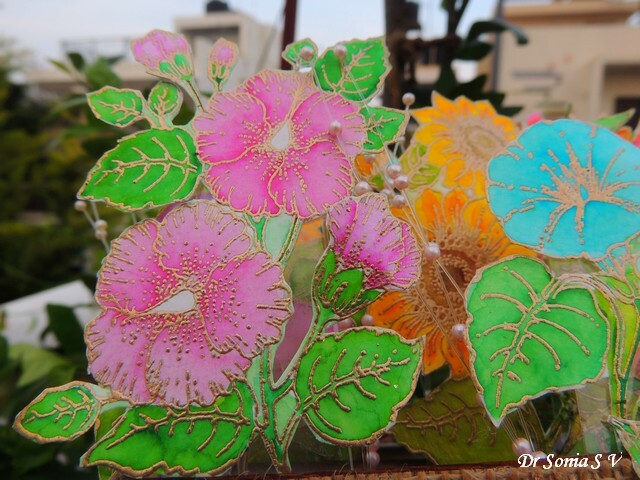 I love rubber stamps and was super impressed at the delicate intricate designs on the Crealies floral stamp sets. 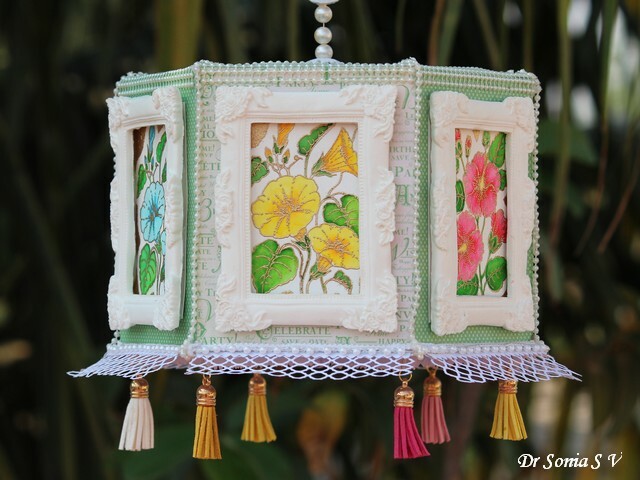 I heat embossed the stamps in such a way that I got a framed border around the floral images . 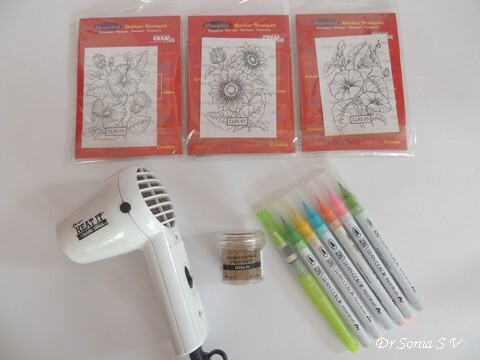 Such delicate images are fabulous to water color using Zig brush pens and a water-brush.To make the hexagonal shaped ornament you need 6 images. 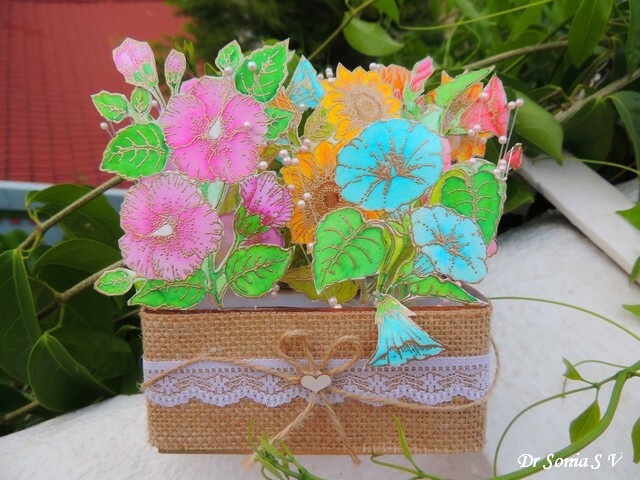 The Crealies flower stamps are all the same size and coordinate so well together. I used 3 stamps and had fun experimenting with different colors. Good adhesive- I used a combination of liquid glue, the glue gun , carpenters masking tape and red tacky tape depending on what I was gluing--- will share in the steps. Though you can make the hexagonal units by manually measuring and hand cutting it is quicker , more fun and neater if you have dies to help you. 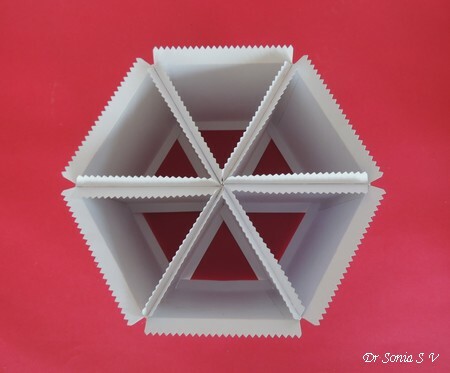 I used the Crealies Cardzz no.06 die to make the units of my hexagonal frame.This die is fabulous for making pockets for scrapbooks, bags , envelopes and special cards but because it has flaps it is simply fabulous to create 3 D projects too. 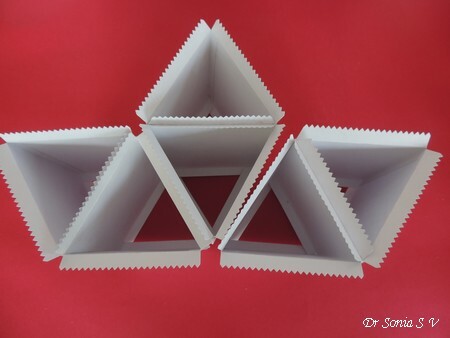 The ornament is made of 6 triangular units each of which is made using 3 die cuts as shown above. 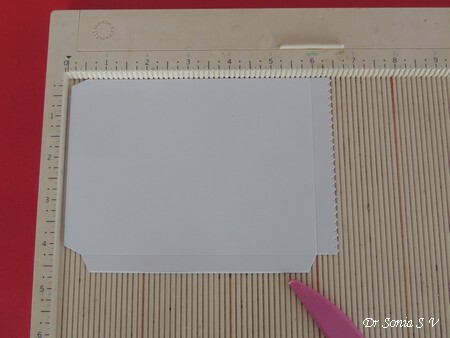 The diecut has a saw tooth/zig zag border on one side and you can optionally score this border ,fold it up and use it to add a decorative lace like I have done or leave it as it is. 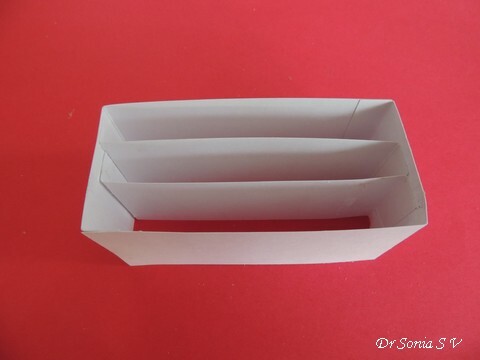 Glue the flaps to adjoining pieces. 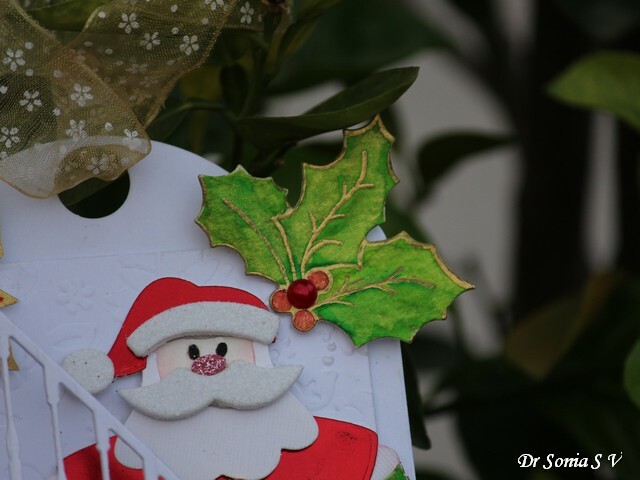 Using a good quality wet adhesive is the best option here as you get strong adhesion and your ornament wont fall apart later even if you add heavy embellishments! 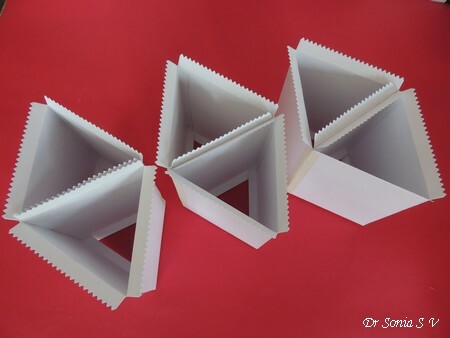 Glue the pieces to form a triangular unit. 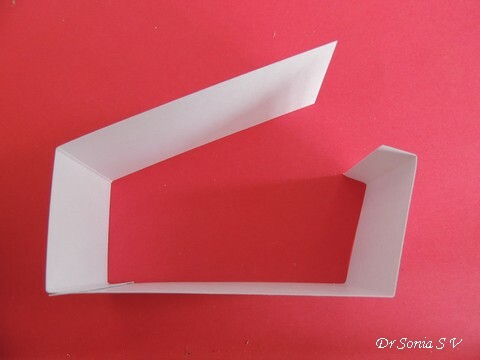 It is easier and neater to make your ornament if you glue 2 triangles to each other on one side. 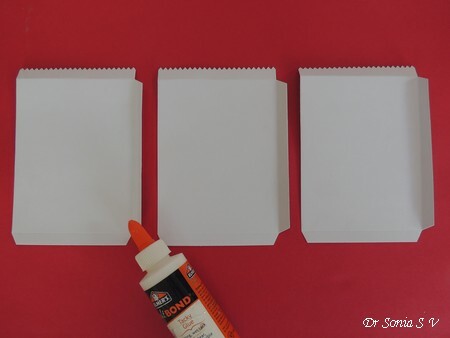 I suggest using carpenters making tape and binder clips or jumbo paperclips to hold your pieces together while your wet glue dries. Make 3 such units as shown below. Glue the pieces to form a hexagon...again using paperclips and masking tape with wet glue and going slowly will ensure you have a sturdy, perfectly geometric ornament you can show off in your home for many seasons! 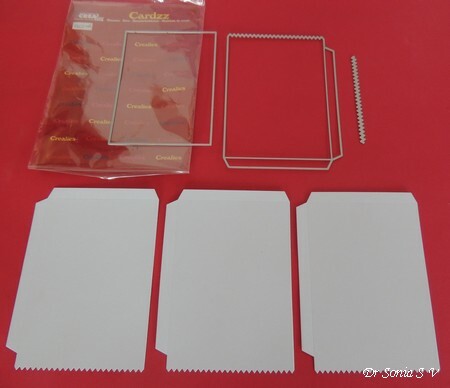 You can keep the saw teeth edge side down as it looks so pretty when you look at it from below and you can also use it to add decorative die-cuts ,laces , beads or tassels. 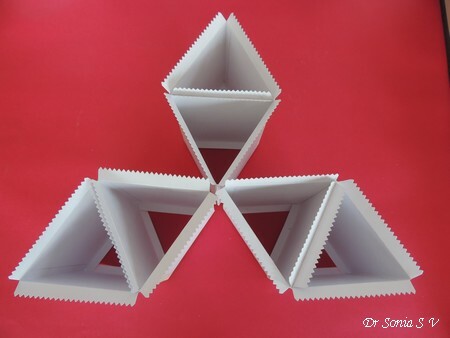 The triangular units look so interesting that you can play with it to make other 3 D designs...see the half star I made by re-arranging the shapes.It would look special as a Christmas Decoration with family photos and festive elements wouldn't it! Or maybe something abstract like this funky shape below! Hehe I think you get the idea! 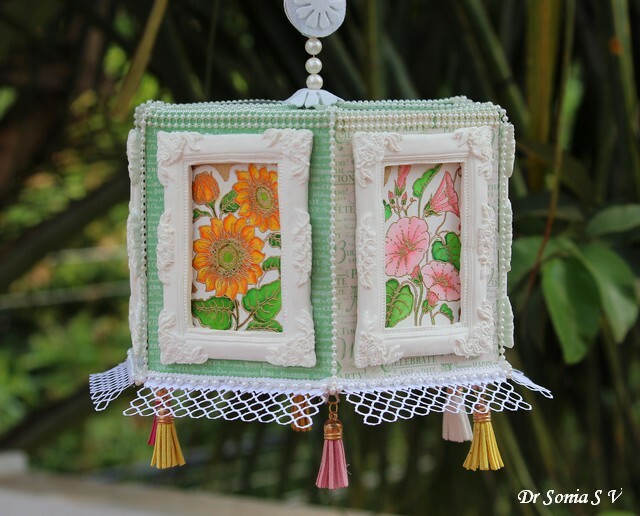 Now coming back to this project...I wanted to give a rich Victorian look to my ornament and added lots of pearls and framed the gorgeous images in Victorian style DIY frames. 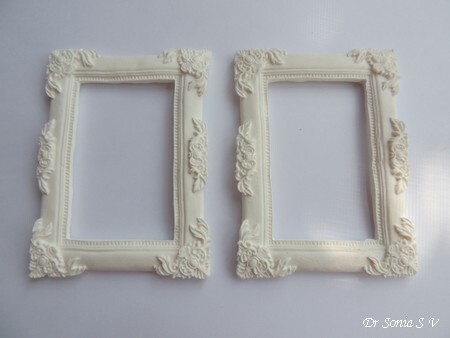 I used Silicon molds and air drying clay to make the frames. I used a Japanese air drying clay from the brand Sakura which by the way is one of the best clay I have used when working with molds! 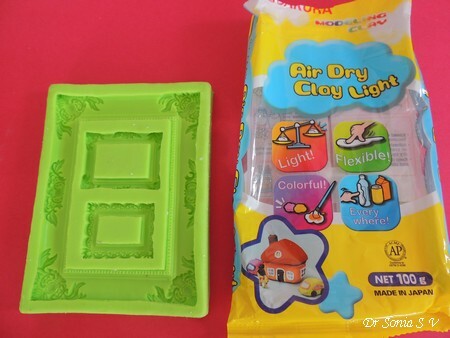 It was super soft , did not crack, did not take long to take the shape of the mold and un-molded easily without having to use anything extra. I used a combination of double sided foam tape and hot glue to add the frames to the floral images. I felt it was not a good idea to use wet glue and risk smearing the watercolored images! You can attach a ribbon or a string of beautiful pearls to the top of your ornament to hang it in your home or boutique! Crafty Tip :Used die cut foam flowers and hot glue to attach the pearl string to the ornament.Foam melts with the hot glue to give a strong adhesion and the lovely flower design hides the blob of glue! I hope you liked my home decor project idea!